Hominy is a traditional food used by many North American Tribes. Some of the corn was dried to preserve and keep it for food throughout the winter months. Dried corn could be made into a food called hominy. 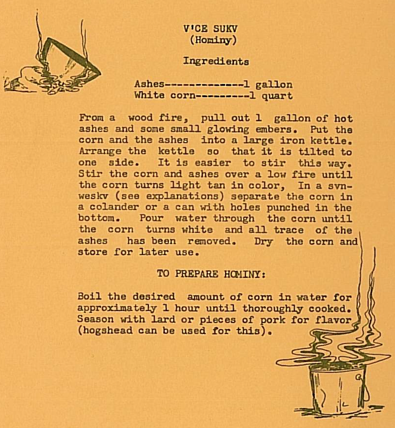 To make hominy, the dried corn was soaked in a mixture of water and hard-wood ashes for two days. When the kernels had puffed up and split open, they were drained and rinsed in cold water. Then the hominy was stir-fried over a fire.